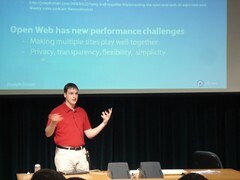 Web site performance guru Steve Souders is teaching a class at Stanford this fall on High Performance Web Sites (CS193H). He invited me to give a guest lecture to his class on the new performance challenges emerging from our work to open up the social web. As a recent Stanford alum (SSP ’02, co-term ’03), it was a thrill to get to teach a class at my alma mater, esp. in the basement of the Gates bldg, where I’ve taken many classes myself. But upon reflection, I realized that a lot of the key challenges in creating a truly social web are directly related to performance, and the set of performance challenges in this space are quite different than in optimizing a single web site. In essence, the challenge is getting multiple sites to work together and share content in a way that’s open and flexible but also tightly integrated and high-performance. Thus my new talk was born. 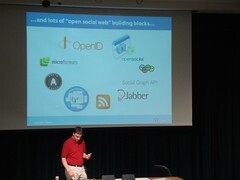 I provided the students with an overview of the emerging social web ecosystem, and some of the key open building blocks making it possible (OpenID, OAuth, OpenSocial, XRDS-Simple, microformats, etc.). I then gave some concrete examples of how these building blocks can play together, and that led naturally into a discussion of the performance challenges involved. integrating third-party content (proxying vs. client-side fetching, iframes vs. inline integration, etc.). In each of these cases, there are fundamental trade-offs to make, so there’s no “easy, right answer”. But by understanding the issues involved, you can make trade-offs that are tailored to the situation at hand. Some of the students in that class will probably be writing the next generation of social apps, so I’m glad they can start thinking about these important issues today. I was invited to speak on a panel at EmTech, the annual conference on emerging technologies put on by MIT’s TechnologyReview Magazine, on the future of the web. The conference spans many disciplines (alternative energy, cloud computing, biotech, mobile, etc.) and we were the representatives of the consumer internet, which was quite a humbling task! Robert Scoble moderated the panel, which featured me, David Recordon, Dave Morin, and Nova Spivak. It was a loose and lively back-and-forth discussion of the major trends we see on the web today: it’s going social, it’s going open, it’s going real-time, and it’s going ubiquitous. These trends are all working together: it’s now common (at least in silicon valley) to use your iPhone on the go to see what articles/restaurants/etc your friends have recommended from a variety of distributed tools, aggregated via FriendFeed, Plaxo Pulse, or Facebook. 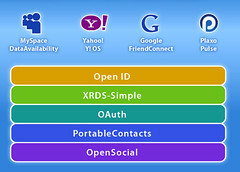 A lot of the vision behind the Semantic Web (structured data enabling machine-to-machine communication on a user’s behalf) is now happening, but it’s doing so bottoms-up, with open standards that let users easily create content online and share it with people they know. As the audience could clearly tell from our passionate and rapid-fire remarks, this is an exciting and important time for the web. We got lots of positive feedback on our panel from attendees (and also via twitter, of course), as well as from the TR staff. We even received the distinct honor of attracting snarky posts from both Valleywag and Fake Steve Jobs (if you don’t know the valley, trust me: that’s a good thing). You can watch a video of the entire panel on TechnologyReview’s website. I must say I’m quite impressed with TechnologyReview and EmTech. They do a good job of pulling together interesting people and research from a variety of technical frontiers and making it generally accessible but not dumbed-down. The piece they wrote recently on opening up the social web (which featured a full page photo of yours-truly diving into a large bean bag) was perhaps the most insightful mainstream coverage to date of our space. They gave me a free one-year subscription to TR for speaking at EmTech, and I’ll definitely enjoy reading it. Here’s looking forward to EmTech09!